ERIK singing at the Confederate Memorial Day Ceremonies in the Romney, WV Courthouse. Image reversed r/l. Here is the story of "DIG THIS"
These are Experimental Electronic versions of some of the songs from the Lo-Fi Acoustic CD, LEGENDS, DREAMS, AND MYTHS. Some are original, some are hundreds of years old, but with tunes supplied by me. Future CD's will have Experimental Electronic Versions of the rest of the songs from "LEGENDS, DREAMS, AND MYTHS." William the Conqueror was Norse by ancestry, which shows the genetic connection between the Normans and their later descendants, the Americans. "Scotland the Brave" is a song of the lowland Scots, who, including among them the Scots-Irish, were of mixed blood -- British, Gaelic, and Anglo-Saxon, but predominantly Anglo-Saxon, which is Norse. About 90% of the names in the muster roles of the American revolutionary army were Scottish. Thus, the revolution was actually a continuation of the border rivalry between the Anglo-Saxon Scots and the English, however being led by English colonists. As such, it was not so much of a revolution, after all. The colonization of modern Scotland, by Iberians (Hebrews), from what is presently known as Ireland, can be of interest to American students of Norse history, inasmuch as these same colonists later interbred with the denizens of the island kingdoms surrounding Scotland, and later became Americans. Take, for example, MacDonald of Skye, who attempted to win Scotland and was checked at the battle of Harlaw. He was half Norse. Yet, the name, MacDonald, is unmistakably Gaelic, nicht wahr? ERIK's Popular EXPERIMENTAL ELECTRONIC MUSIC style, using (on some cuts) Jimmy Arnold's old Ovation guitar. "Jacob's Dreaming Stone" traces the bearing of the stone whereon our father Jacob laid his head to dream. The saga begins with his departure for Laban's farm. The stone is relocated to Scotia, which is presently known as Ireland, thence to present-day Argyll, thence to Scone, and eventually to the British coronation seat. This song includes the core song, "Dalriada," which tells of the "Irish" colonization of "Scotland" in the 5th century, leading to the existence of the "Scots" of Scotland. William the Conqueror is one of the links between Viking civilization and the eventual creation of America. In the early 1980's I wanted to put those links into song. I wrote a song that lasted 20 minutes, all singing, without instrumental breaks, and p layed it at a couple of parties, and after about the 5th verse, people stopped listening and started conversing. In consequence, I shortened the song a couple of times, until there were only five verses, those having the most dramatic or indispensable scenes of the narrative. Having lost some of the words from my memory, I took out a book about the Norman Conquest, in order to patch the lacunae in the verses. Upon more closely scrutinizing the story, I came to realize that the Normans were the agents of church building and rebuilding in the region at the time, whereas the other factions were much less entwined with the Roman church-organization, while some were of the old religion. Thus, I added a reference to the Norman connection to the Roman church. The book, "Holy Blood, Holy Grail", points to a Benjamite origin of the Franks. The Normans interwedded with the Franks. The Assyrian border-guard reports on clay tablets are synoptic with Greek and other histories, which, combined with one another, establish a link between the Hebrew tribes of Assyrian captivity, and the subsequent tribes of Europe, such as Scandinavians, Kelts, Saxons, Iberians, Scythians (who later became known as "german"=genuine Scythians in order to distinguish them from the Sarmatians, who drove them out of their territory, and thus became also known as Scythians), etc.. Thus, I added a verse at the beginning of the song, pointing to parts of the origin of the Normans. The core of the song was written either in D.C. or possibly in Washington, VA, or maybe in Poolesville, MD, in the early-to-mid 1980's. The later additions and gap-fillings were done in Frostburg, MD, about the years 1999 and 2001. When I write song lyrics I just whip them out. Occasionally I get stuck for a rhyme that means what I want it to mean, but it takes only about ten minutes to half an hour to finish a verse. When I first got my groove box, in December of 2001, I had already a copying of the song done acoustically, as a deposit for the copyright office. I put that on an acoustic CD entitled, "Legends, Dreams, and Myths" (http://wodin.is.jahweh.tripod.com/legends.dreams.myths.html) while I was learning to program the groove box. Then I programmed an accompaniment to the singing of William the Conqueror, which, by the advice of my collaborator, Marc Slanger (http://www.aboutcultfilm.com) was deliberately quasi-acoustical sounding, not too electronic, or techno. Then I added an experimental electronic long break after the end of the lyrics. It was too hard to sing the verses all in a row without a break between the refrain and the verse (I needed time to remember what the next verse was going to be), so I added electronic quasi-baroque breaks in those places. It took a long time to get the volumes of the different patterns to match together, since the synthesizer on each pattern had a different "effect" from the other patterns. Some were too loud, some too soft, some had the drums too loud, etc.. It took a long time to balance it. 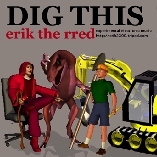 Finally Marc and I captured the song and put it into a CD entitled "Dig This" (http:wodin.is.jahweh.tripod.com/dig.this.html) I would like to add that when I first made the song, it was kind of humorously inspired by the children's song, "Sparky the Fire Dog." The live premiere of the song was done as the opening act at the premiere of Marc's and Tyler Ralston's movie, "Dracula Versus Frankenstein", on May 11 of 2002, at the Palace Theatre in Frostburg, MD.